Fridays are the days to look forward to each month as The Royale Bintang Penang has been serving great spreads of BBQ items for quite many years – Friday Night Poolside BBQ Buffet. Priced at RM88.00nett (Adult) and RM44.00nett (Child: 6-12 years old/Senior Citizen: 60 years old and above), diners can enjoy the cool breeze of the night by dining next to the hotel’s swimming pool. The spread can be quite extensive, starting from boutique salad, salad bar, soup, hot dishes, long live stations, meat to order bar, DIY hawker dish to a wide selection of desserts and fruit cuts at their Sweet Seventeen station. Don’t forget to enjoy your free-flow of coffee or tea after your hefty meal too. To start off your meal, do check out the salad and soup station for some sumptuous local and international fare. What caught my attention was the Sup Tulang Rawan Kambing which was pepped with fragrantly selected herbs and spices. It was indeed something delicious to boost up the appetite for more feasts to come. Moreover, it was great to find some local street dish such as the Sotong Kangkung and Thai-style salads such as the Seafood Glass Noodles Salad as well as Mango & Papaya Salad amongst the spreads. As for the Hot Dishes Station, you have some fried rice and noodles but what interests me was the Baked Pumpkin Wedges which I rarely see at most BBQ buffet. The Jacket Potatoes with Chives Sour Cream was also one great side dishes to go with the BBQ items. The BBQ and street food adventure would begin at the Long Live Stations and Meat To Order Bar where the aroma along from the wonderful grills would send your saliva dripping furiously. The tender and juiciness from the Royale Spiced Roasted Whole Lamb and flavorful Grilled Minute Steaks are some of the items to look out for. Don’t missed out the Samurai Burger too as the patties were in-house made with perfection. There’s always some part of the stomach left for some desserts. Do check out the Dessert Station with a mixed of local delicacies to some international cakes and puddings. I quite like the Pengat Pisang Sago which was pepped up with the fragrantly acclaimed Gula Melaka. You can check out the full spreads available on each Friday night as per menu below. Do click for a better viewing. Overall, I’m quite satisfied with the spreads for the Friday Night Poolside BBQ Buffet, especially those red meat choices where the meat had that smoky flavors on top of the nice marinates. The best part would be midway into the buffet where the staff would bring out the “surprise” – slipper lobsters. Those mini lobsters are to die for as they were indeed super delicious to resist. Do also check out their flyers for more promotions. For those who love their tea, the hotel also offers an exclusive Special Luxury Afternoon Tea Package which serves the finest luxury tea brand in the world, TWG Tea, as well as deluxe tea sandwiches, baked warm scones and a selection of cakes. It is available at the Tea Room at only RM60.00nett per person. Penang is known as the food haven of Malaysia and the Royale Bintang Penang also prides itself on the food served that leaves its guests coming back for more. To encourage the guests to come back regularly for the food, The Royale Bintang Penang also launched the “I Love To Makan” monthly Facebook photo contest last year. Guests who dine at any of the food outlets will need to just take a photo of them dining and post it on the hotel’s official Facebook page. The picture with the most number of likes will win attractive prizes from the hotel. “Penang is one of the most dynamic destinations for business and leisure travel. With the hotel’s unique historical and architectural buildings steeped in British Colonial style, it blends together the modern and multi ethnic heritage of the people who call Penang “home”. It’s been an amazing 3 years and we hope to continue providing luxurious comfort and full amenities for the leisure travellers as well as the perfect setting for celebrations, business meetings and corporate events.” said Philip D. Theseira, General Manager of The Royale Bintang Penang. As you enter the lobby of the hotel, just walk to the elevator and go to Level 2 of the heritage building. You can see the poolside BBQ there. Address: 1&2, Pengkalan Weld (Weld Quay), 10300 Georgetown, Penang, Malaysia. ABOUT THE ROYALE CHULAN & BINTANG HOTELS & RESORTS: The Royale Chulan & Bintang Hotels & Resorts (managed by Boustead Hotels & Resorts Sdn Bhd registration number 147089-A) has secured a strong footing in the local hospitality industry, beginning its venture with the launch of the flagship property The Royale Bintang Kuala Lumpur. Since then, the company has strengthened its portfolio to build and grow further in the brand of True Malaysian Hospitality with the addition of six other hotels, namely the 5-star properties The Royale Chulan Kuala Lumpur and The Royale Chulan Damansara. Therefore, as of year 2017, with the recent opening of the Royale Chulan Hyde Park in London last year, there are now eight Royale Bintang branded hotels with the new Royale Chulan Cherating Pahang pending operations by mid-year 2017. The Royale Chulan & Bintang Hotels & Resorts is a Malaysian chain of full-service hotels, founded and owned by Boustead Hotels & Resorts Sdn Bhd – a subsidiary of the diversified public listed conglomerate Boustead Holdings Berhad. The company places marketing emphasis on business travel, but operates one leisure-oriented resort as well. The Royale Chulan & Bintang Hotels & Resorts strive to become a stylish and forward thinking leader of hospitality. From gala events to banquets to business meetings to romantic days to remember, the group strongly holds to its tagline – We Are Where You Want Us To Be. Malaysia’s all-time favorite Japanese restaurant, Sushi King from nationwide would be promoting several delectable auspicious dishes this festive season to usher in the Rooster this coming Chinese New Year 2017. Quality and Freshness have always been the priorities of Sushi King to ensure the fulfillment of its diners. The promotion would be “Doubly Fresh, Doubly Joyous” from 1 January 2017 until 28 February 2017. More surprises would be shared below. To start off a brand new season, do toss to a doubly joyous and prosperous year with the highlight of the season, Prosperity Yee Sang (RM45.88++ for 4-6 pax). The dish is made with fresh quality ingredients rather than those prepacked versions and served with premium Norwegian salmon, harvested from the clear blue waters of Norway. Sushi King’s Prosperous Yee Sang is indeed a version out from the norm as it has all the healthy julienned vegetables plus crunchiness coming from their daily made tempura bits. Moreover, what I like most about this version is that it has both sliced and minced salmon added. Thus, everyone would have a fair share of the delicacy. You would have an option to choose their Tangy Plum Sauce or with a combination of Tangy Plum Sauce & Wasabi Sauce. You can also have their Regular Yee Sang (RM38.88++ for 4-6pax) or Longevity Yee Sang (RM18.88++ for 2-3 pax). However, my preference would still be the Prosperity Yee Sang. For those who would like to try out their Yee Sang but do not have the crowd to join in, you can have your personal mini Yee Sang, by ordering their CNY Bento (RM19.90++). The bento would come with deep fried chicken, deep fried salmon and served with fragrant Japanese rice. Alternatively, if you do not like Yee Sang, you could also try out their Seafood Bento (RM18.90++). This dish has tempura batter fried salmon, squid, prawns, long bean and korokke (potato croquette), served with fragrant Japanese rice. For this festive season, you would also get to try our Sushi King’s own version of Salmon Don (RM8.88++). It has deep fried salmon belly and flying fish roe on top of their fragrant Japanese rice. On the other hand, their Ontama Salmon Don (RM8.88++) would be a little different as it has salmon flakes, soft boiled egg and flying fish roe on top of their fragrant Japanese Rice. There will also some special sushis exclusively created for this season such as the Spicy Salmon Teriyaki Sushi (RM5++), Salmon Teriyaki Sushi (RM5++), Fried Salmon Sushi (RM5++) and Assorted Sushi (RM6++). For dessert, we had Hanjuku Cheese Cake (RM4++/pc), a soft baked cheese cake that caught me yearning for more. It was extremely delicious for everyone, regardless of age, as the sweetness and fluffiness of the cake was just right. I would advise you to request for a chilled version as it was perfect to end any meal. Do check out on the current promotion (1 January 2017 – 28 February 2017) as each customer who spends RM68 and above in a single receipt at any Sushi King outlet, can receive an exclusive set of Sushi King Daruma Ang Pows and he/she would also be entitled in the running of the “Win an all expenses paid” trip to Tokyo. Overall, I’m contended with the dishes served, especially the fresh air-flown Norwegian salmon dishes. On top of that, the Prosperity Yee Sang with sliced and minced salmon is a great way to enjoy the dish to ensure that everyone has their share of raw salmon. The CNY Bento on the other hand was also a great dish to ensure that each diner would have their own portion of yee sang for the joyous occasion. Let’s welcome the arrival of the Red Fire Rooster during this coming Chinese New Year 2017 with wonderful spreads of Chinese delicacies from Sukkah Coffee House @ Olive Tree Hotel, Penang. Olive Tree Hotel ensures only the best and finest dishes are served in the Chinese New Year menus. On Chinese New Year’s Eve, Olive Tree Hotel will be offering both buffet and 8-course dinner in its Grand Ballroom. It is indeed an opportunity not to be missed for those who want to get a taste of traditional and authentic cuisines from various Chinese people groups such as the Hakka, Cantonese and Teochew. This will be accompanied by live performances like lion dance, Chinese orchestra and many more, guaranteed to keep the evening exciting. Skip the hassle of cooking and cleaning and spend more time with your family. Celebrate the first and second day of Chinese New Year with a buffet lunch or dinner with your loved ones. Large families can benefit on the Buy 5 free 1 promotion for buffet lunch on both days. Ongoing 7-course and 8-course meals are also available for pre-celebration until the 15th day of the Chinese New Year. These meals are available by advanced booking and each booking will be held in a Chinese New Year-themed private function rooms – ideal for private groups, family celebrations and company meals. For reservation and enquiries, please contact Sukkah Coffee House at +604-637 7873 to make prior booking to avoid any disappointment. Let’s dive in and savor the best of the best during this auspicious celebration with their RM888nett package. As how it should be, the Olive Tree Yee Sang Platter would be presented to the diners to “lo hei” in a great year of great fortune, a symbol of abundance, prosperity and vigor. Next on the line up would be the Double Boiled Chicken Soup with Sea Cucumber and Scallops, a rich and nourishing soup which had obvious taste of the long simmering hours to pep it up. The Crispy Golden Roasted Duck was something that had us gobbling up more as it was done to perfection with crispy skins and tender meat. We also tried out their Steamed Garoupa with Superior Soy Sauce, fresh and succulent until the last bit. The size of the fish was just nice for a table of 10 pax. The Braised Mushrooms & Homemade Tofu with Scallops & Broccoli may look simple but the overall dish was filled with just the right flavors and “wok hei”. On the other hand, the Stir Fried Tiger Prawns with Butter Cream Sauce was something quite unique in flavors. I quite like the portion served too. The Authentic Claypot Chicken Rice was something that I did not expect to see on the menu but it was so skillfully prepared with some charred flavors to pep up the flavors more. How I wished there with some deep fried bits of salted fish added to make the dish more Malaysian. Lastly, we had Snow Fungus with Ginkgo Nuts in Soya Bean Milk which was a great dessert to end the meal. Overall, the package deal of RM888nett for 10 pax was more than adequate for consumption as the portion could be rather big compared to some of the eateries available out there. The dishes were flavorful and had some nicely pepped up dishes such as the roasted duck and claypot chicken rice. Vistana Hotel Penang Bukit Jambul had always been one of the main banquet providers, with support from the corporate and public sectors for quite many years. This year again, diners would have the privilege the Chinese New Year spreads from the Hong Kong Master Chef Ng Wing Lam with more than 40 years of culinary experiences from Hong Kong and Asia. The Chinese New Year Yee Sang Banquet 2017 promotion would start from 8 January 2017 until 11 February 2017 (Lunch: 12.00pm-3.00pm & Dinner: 7.00pm-10.00pm). For more information, you can email vispg@ytlhotels.com.my or call +604-646 8000 for enquiries and reservations. You have an option to choose from the menu as shown below with pricing starting as low as RM688++ per table for 10 persons. However, the hotel does also provide the flexibility to customize your dishes as what we had earlier. I would be sharing with you some of dishes plucked from the 3 different menus available. The main highlight of the dinner was the Prosperity Salmon Yee Sang, a rather out of the norm dish with jellyfish, freshly julienned carrot and radish plus some deep fried julienned yam on top of the usual other ingredients. The next on the list was the Double-Boiled Chicken Soup with Ginseng and Chinese Herbs, packed with herbal flavors and chunks of boneless chicken thigh meat. We were also served with Fried Boneless Chicken with Spicy Mayonnaise, a set of 3 batter fried boneless chicken served on a bed of spicy mayonnaise. It was a rather unique dish, except that the portion might be quite small for a table of 10 pax. As usual, there would be a fish dish to symbolize years of abundant wealth and we had the Steamed Red Lion Fish with Superior Soya Sauce. Not bad but it could be better in size. The Braised Broccoli with Black Mushrooms, Pacific Clams and Fatt Choy was another usual dish you would get in a banquet style of serving. We also had the Chef’s Special Deep-Fried Prawns. The sizes of the prawns were indeed bigger than the normal servings. The Gemini Fried Rice with Assorted Meat & Vegetables might not look appetizing as I would expect some additional julienned iceberg lettuce to be added in like last year to add in more colors and flavors to the dish. However, look can be deceiving as the dish was quite palatable. We ended our meal with Double-Boiled Dried Longan and Red Dates with Glutinous Rice Balls. It was a rather balanced Chinese dessert with tasty sesame paste filled glutinous rice balls. The bonus dessert of Sweet Rice Cake was something that caught our attention most as they could be rather addictive. There were hint of sweet potatoes, yam and lotus paste in each of the mini ball. Overall, the dishes served for the night was quite fulfilling but it could have been better in terms of portion. The ballroom can only cater up to 500 pax at one time, so do email vispg@ytlhotels.com.my or call in +604-646 8000 to make your advance reservations to avoid any disappointment. The ballroom is located at the left side as you enter the hotel lobby of Vistana Hotel Penang along Jalan Bukit Gambir. You can park your car at the basement which would require you to get a magnetic card from the receptionist to scan your way out. Let’s welcome the Red Fire Rooster for this coming Chinese New Year 2017 with abundant of seafood products during the forthcoming Chinese New Year Mega Sales 2017 organized by Golden Fresh Sdn. Bhd. at its warehouse, Butterworth Iceworks Sdn. Bhd., from 10.00am until 7.00pm on 24-25 January 2017. Various seafood and seafood products are up for grab on these 2 days. It’s a “Cash & Carry” sale while stock last. In line with being environmental friendly, please bring along your own carriers. If you are coming out from the ferry terminal, just drive straight into Jalan Chain Ferry and drive on until you see a Shell petrol kiosk on your left (as well as right). Drive up until the traffic lights and turn right into Jalan Kapal. You can see Restoran Nasi Kandar Al-Bismi Maju at the corner unit. Drive on until you see Lengkok Kapal on your left. Drive in further and you can see the Butterworth Ice Works factory on your right. Alternatively, if you are driving via Penang Bridge, turn left into the second exit leading to Megamall. Drive on Jalan Baru until you see a flyover. Drive up the flyover and turn right into Jalan Chain Ferry. Drive all the way, crossing over Sungai Perai until you see a tall metallic silver building (Wisma Unimech) on your left. Drive on until you see the traffic lights and turn left into Jalan Kapal. Perodua Service Center is just opposite at the corner unit. You can also see a sign leading you to Taman Limbungan Indah/Econsave Butterworth. Drive all the way until the end and you would see the factory on your right. Name: BUTTERWORTH ICEWORKS SDN. BHD. 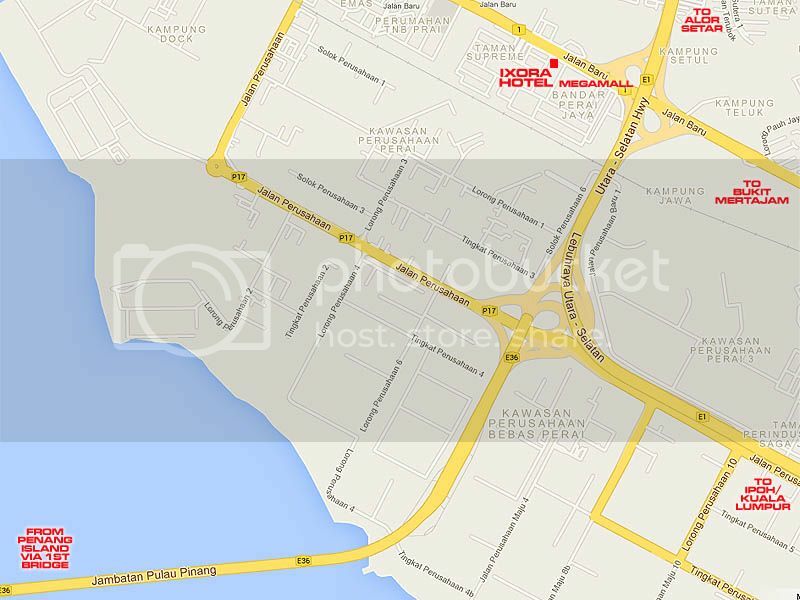 Address: 4402 Jalan Chain Ferry, 12100 Butterworth, Penang, Malaysia.